Experts weigh in on nutrition recommendations for this essential micronutrient that has been a source of confusion for vegan consumers. "Vegans can get vitamin B12 through natural bacteria in their mouths." "It's a myth that vegans need to take vitamin B12 supplements." "You can get enough B12 from the soil on your vegetables if you don't wash them." These are just three of the common myths floating around the plant-based community surrounding vitamin B12 intake and vegan diets. In fact, some popular vegan websites and publications hold the philosophy that vegans can meet all of their essential nutrient needs without the use of any supplements. It's extremely important for health care professionals—as well as clients—to understand the significance and intricacies of sufficient vitamin B12 intake for vegan diets, because deficiency of this essential micronutrient is serious business. Norris says the story doesn't end there. He reports that most vegans show adequate B12 levels to make clinical deficiency unlikely, but they may show restricted activity of B12-related enzymes, leading to elevated homocysteine levels, which has been linked to increased risk of heart disease and stroke. Thus, he warns that repeated observations of elevated homocysteine levels in vegans show that B12 intake must be addressed. All vegetarians, regardless of type, should periodically be screened for B12 deficiency, using either methylmalonic acid (MMA) or TCII (transcobalamin) assessment. All vegans should take 250 mcg per day of a B12 supplement. All lacto-ovo vegetarians should consider taking 250 mcg per day of a B12 supplement a few times per week. Norris recommends MMA and serum vitamin B12 tests for vegans, adding, "You don't need to get tested just because you're vegan; rather, you should make sure you follow the recommendations for intake." Reed Mangels, PhD, RD, LDN, a vegan nutrition expert and associate professor of nutrition at the University of Massachusetts Amherst, also looks at MMA, as well as homocysteine levels, to see if B12 status is adequate. "B12 works with other B vitamins in many biochemical cycles, so it's important to understand the whole picture and look at a variety of nutrients," she says. So, what can dietitians do to clear up confusions on B12? The first step may be identifying some of the common myths. Norris says, "There's less confusion than during the 1990s and early 2000s, but there's still a lot. Many vegans don't think [they] need to worry about B12, or they think that meat-eaters get B12 deficiency just as often as vegans do, while others think you have to supplement with methylcobalamin rather than the less expensive, more reliable cyanocobalamin." Mangels notes, "Some people think they have enough vitamin B12 stored and they don't need to worry about [it]. There's some confusion about reliable sources also. I wouldn't count on sources like seaweed, spirulina, or soil." 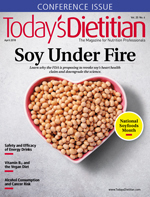 "I hear people that likely do need to supplement with B12 say that they're OK because they eat foods that may include B12, but they can be unreliable sources, such as sea vegetables or nutritional yeast," says Ginger Hultin, MS, RDN, CSO, a lifelong vegetarian, chair of the VNDPG, and spokesperson for the Academy. After setting clients straight on vegan vitamin B12 myths, it's important to educate them on meeting their specific needs through supplements and fortified foods, Hultin says. "Each person should be treated as an individual, with their diet and health history in mind." — Sharon Palmer, RDN, is the nutrition editor for Today's Dietitian and is an MS student studying sustainable food systems at Green Mountain College in Vermont. 2. Pawlak R; Vegetarian Nutrition Dietetic Practice Group. RD resources for professionals: vitamin B12 in vegetarian diets. https://vndpg.org/docs/rd-resources/B12-RD.pdf. Published 2012. Accessed February 2, 2018. 3. Walsh S. What every vegan should know about vitamin B12. The Vegan Society website. https://www.vegansociety.com/resources/nutrition-and-health/nutrients/vitamin-b12/what-every-vegan-should-know-about-vitamin-b12. Published October 2001. Accessed February 2, 2018. 4. Vitamin B12: fact sheet for health professionals. National Institutes of Health, Office of Dietary Supplements website. https://ods.od.nih.gov/factsheets/VitaminB12-HealthProfessional/. Updated March 2, 2018. Accessed February 2, 2018. 5. 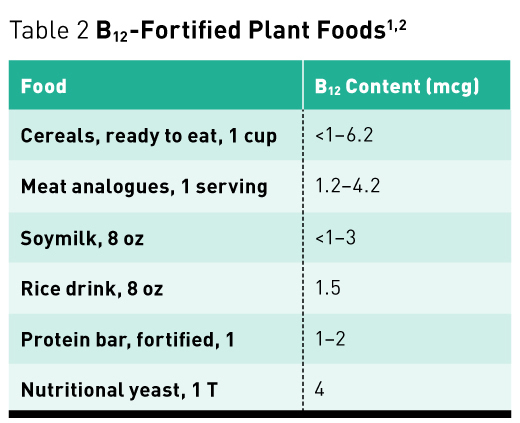 Norris J. B12 in plant foods. VeganHealth.org website. http://www.veganhealth.org/vitamin-b12-plant-foods/. Updated October 2015. Accessed February 5, 2018. 6. Melina V, Craig W, Levin S. Position of the Academy of Nutrition and Dietetics: vegetarian diets. J Acad Nutr Diet. 2016;116(12):1970-1980. 7. Wokes F, Badenoch J, Sinclair HM. 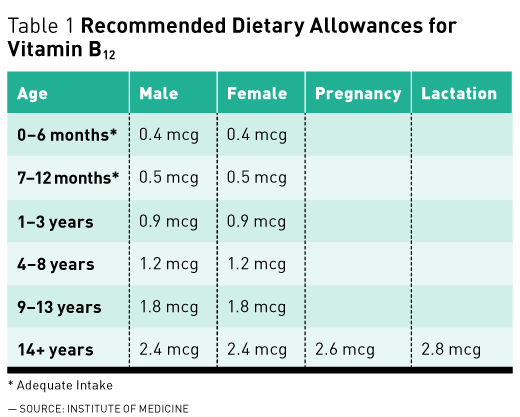 Human dietary deficiency of vitamin B12. Am J Clin Nutr. 1955;3(5):375-382. 8. Norris J. Vitamin B12. Vegan Health website. https://veganhealth.org/vitamin-b12/. Accessed February 5, 2018.